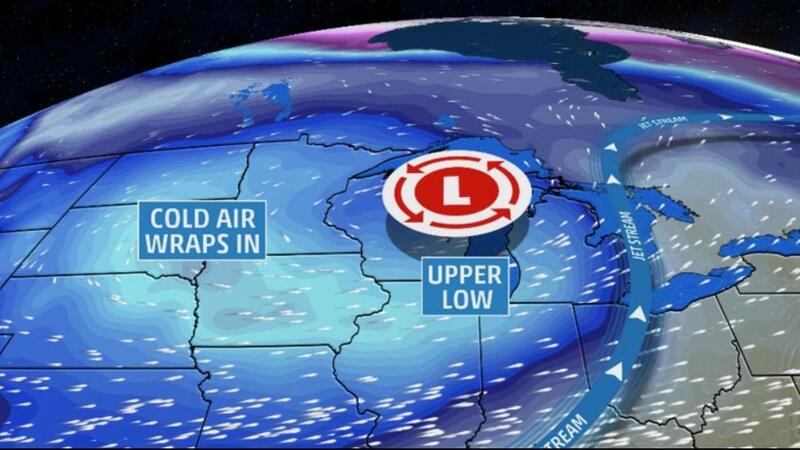 Winter Storm Delphi has been named by the winter storm naming committee at The Weather Channel. Delphi will bring significant snow to parts of the northern Plains and Upper Midwest to start this week, including Minneapolis/St. Paul, Sioux City, Iowa, and Sioux Falls, South Dakota. Low pressure in the upper atmosphere has been stuck swirling over the Great Basin during the Thanksgiving holiday, trapped to the south of a corresponding area of high pressure aloft in an atmospheric logjam known to meteorologists as a "Rex block". As a result, the weather had been rather stagnant and unchangeable, with periods of freezing rain, sleet and snow in the Plains and West from Winter Storm Cara in recent days. Now, that blocked-up jet stream pattern is finally giving way. The upper-level low mentioned above will finally pivot east into the Midwest early this week. As it does so, moisture in the atmosphere will be lifted, and cold air in place will yield a swath of snow from late Sunday into Tuesday night from the High Plains to the Corn Belt, Upper Mississippi Valley and northern Great Lakes. Winter storm warnings and watches have already been posted from central Kansas through eastern Nebraska, eastern South Dakota, southwestern Minnesota and northern and western Iowa, meaning the possibility exists for snowfall amounts greater than 6 inches within the next 48 hours. Winter weather advisories are in effect across the Texas Panhandle, western Oklahoma, western Kansas, central and southern Nebraska, central South Dakota, south-central North Dakota, as well as in parts of eastern Minnesota and northwestern Wisconsin, where somewhat lower snowfall totals are anticipated. In addition, some sleet or freezing rain is possible to the east of that snow area from the Texas Panhandle and northwest Oklahoma to central Kansas, southeast Nebraska, central Iowa, far southeast Minnesota and southwest Wisconsin. 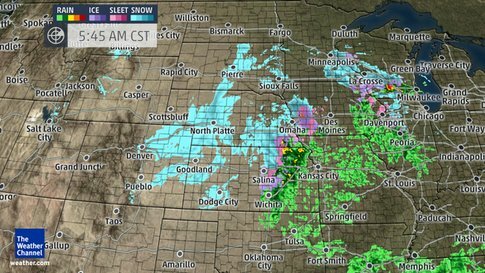 Snow, possibly heavy, continues in parts of the northern and central Plains, including South Dakota, southeast North Dakota, Nebraska, parts of northwest Iowa, central and southern Minnesota and northwestern Kansas. Mixed wintry precipitation is expected from north-central Kansas, southeast Nebraska to central Iowa, far southeast Minnesota and southwestern Wisconsin. 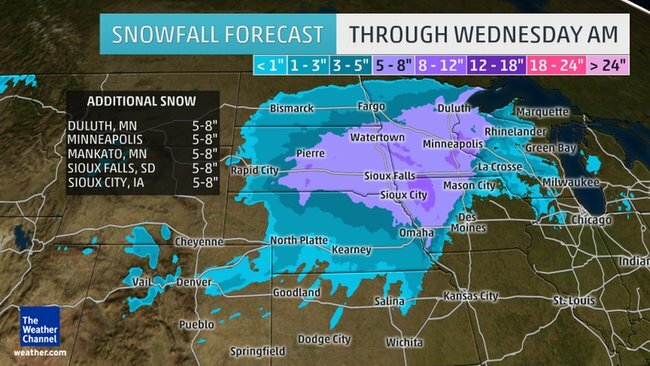 This may lead to a challenging morning commute in Omaha and Lincoln, Nebraska. 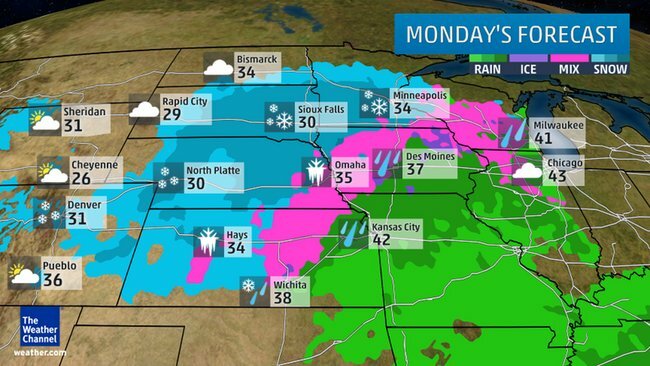 Monday afternoon's commute may be tricky in Sioux Falls, Omaha, and Minneapolis/St. Paul. 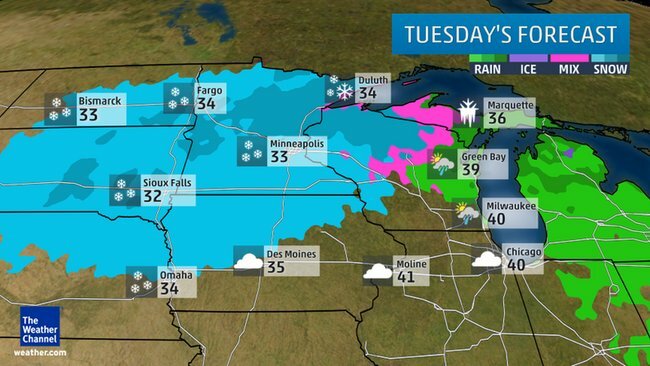 Leftover snow is possible in the northern Great Lakes and Upper Midwest, from Michigan's Upper Peninsula to northern Wisconsin, Minnesota, Iowa and parts of the Dakotas. This has the potential to disrupt both the morning and afternoon commutes in Minneapolis/St. Paul, and leftover snow and wind in the morning could also pose problems in Sioux Falls. Any lingering snow showers should end early on Wednesday. 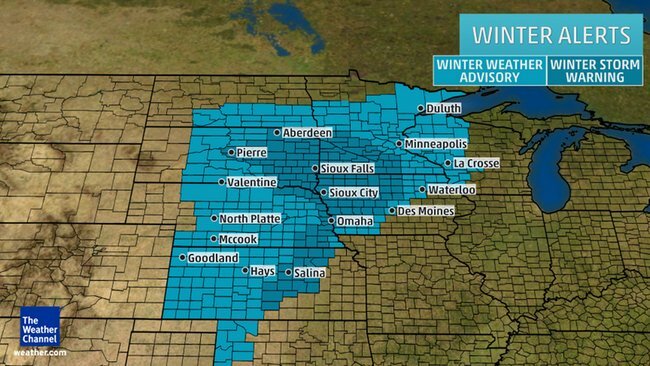 At least 6 inches of snow possible: parts of northeast Nebraska, eastern South Dakota, extreme southeast North Dakota, northern Iowa, southern and central Minnesota, and northwestern Wisconsin. Lighter snowfall possible: Northern Minnesota, Colorado, northern New Mexico, western/northern Kansas, western/central/southern Nebraska, western South Dakota, south-central North Dakota, central/southwest Iowa, northeast Wisconsin and the Upper Peninsula of Michigan. Parts of southeast South Dakota, northeast Nebraska and northern Iowa just finished digging out from Winter Storm Bella, which dumped up to 18 inches of snow near Sioux Falls last weekend. At the same time, Minneapolis/St. Paul finally picked up its first measurable snowfall of the season on Thanksgiving Day, their seventh latest "first snow" of the season on record. Interestingly, according to the National Weather Service, the period from September 1 through November 26 was the second warmest such period on record in the Twin Cities. The last snowstorm of 6 inches or more in the Twin Cities (airport) was April 3-4, 2014. The last official 10 inch snowstorm at the airport was Dec. 9, 2012 when 10.5 inches accumulated.